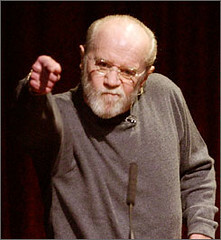 Another great journalist has died: George Carlin succumbed to a heart attack yesterday at the age of 71. I expected to see a strong Uranus component to his chart since he was so irreverent and iconoclastic, and there is a wide conjunction of Uranus to a Sun/Mercury conjunction in Taurus. The combination of the Sun and Mercury indicates a brilliant mind with fixed ideas, and the presence of Uranus there illustrates the dislike of conventional thinking which is contrary to the Taurus nature. There is also an exact Chiron/Moon conjunction which suggests a deep and painful wound at the heart level. We never know the deepest emotional workings of public figures, but most comedians are driven by pain to find humor in their situations and this was likely true of George Carlin. Sadly, his wife of nearly 40 years died in 1997 and he was subsequently treated for drug and alcohol addiction. His irreverence was never as biting as when directed at religion, and this is not surprising considering an exact opposition in his chart between Jupiter (shared theologies) and Pluto (compulsion and transformation). He often said he prayed to Joe Pesci instead of to God, and invented the Frisbeetarian religion. At the time of his death transiting Uranus was making an exact square to the Chiron/Moon conjunction in his chart. I suspect that Chiron was ready to leave this earth and Uranus provided the liberating force for him to make his exit. Jill has a great article on Carlin along with videos. Astrotheme has a comprehensive bio along with the chart. He will be greatly missed by those of us who recognize that the Emperor isn’t wearing any clothes.